A wine brand known for challenging convention through its innovative blends. 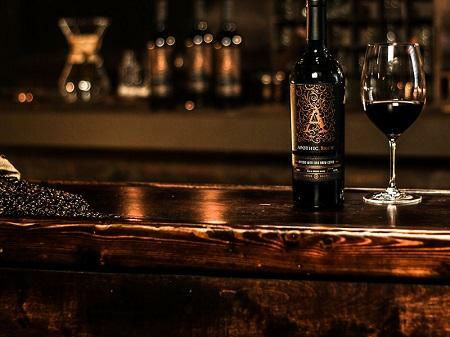 Apothic has created a one-of-a-kind wine infused with cold brew coffee labeled Apothic Brew that will hit shelves nationwide on April 1st. Apothic Brew is a response to the growing demand for cold brew coffee in the United States. Which grew a staggering 430% between 2015 and 2017. Utilizing more coffee grounds than traditional coffee and requiring a significantly longer and more delicate steep. Cold brew coffee is much smoother than its warmer counterparts. Cold brew’s smooth texture and supple flavors come from the brew’s temperature, which doesn’t bring out bitter components of coffee grounds like hot water can. The result is a taste that captures the smooth mouthfeel and velvety chocolate notes of cold brew with the juicy blackberry characteristics of a dark red wine.